Oliver Sacks died in August 2015, just months after the publication of his superb memoir, On the Move. In it, he introduced the reader to a cast of characters, each of whom helped shaped Sacks into the man he became. His mother and father, his marvelous aunt, his troubled brother Michael, as well as some famous names, W. H. Auden, who taught Sacks that every birthday must be celebrated, no matter the number, no matter the circumstances, and Francis Crick, who unraveled the mysteries of DNA, and who taught Sacks even by his approach to death and dying. 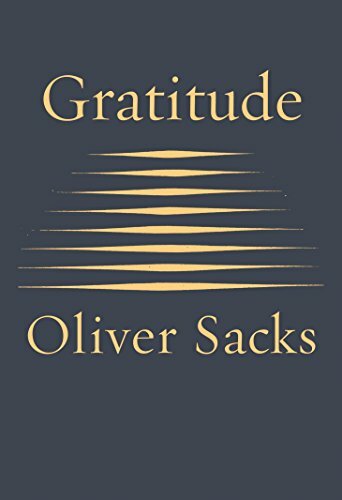 The four essays in Gratitude were written during the last four years of Sacks’s life. “Last night I dreamed about mercury—huge, shining globules of quicksilver rising and falling. Mercury is element number 80, and my dream is a reminder that on Tuesday, I will be eighty myself. In a memoir even briefer than the one that Hume wrote in a single day after having been given a diagnosis of fatal illness, Sacks here leaps across the stepping-stones of his life, his days on Venice Beach when he was passionately involved in muscle building, his “near-suicidal addiction to amphetamines in the 1960s,” and his slow recovery after he moved to New York City and began work with patients in chronic care—the work that would ultimately lead to his book Awakenings and transformed his life. “Sabbath” was created to show, one last time, the landscape of Sacks’s life, including the creation of his memoir and the publication of the first essays of this collection, each of which found a home in The New York Times. It also recalls a visit to Israel on the occasion of a hundredth birthday celebration of a beloved cousin. During the visit, Sacks once more encountered his deeply religious family. Thus, old hurts are healed, old thoughts and fears and memories good and bad are taken out once more and examined, then put away again or discarded. To say that this tiny book is perhaps Oliver Sacks’s best is not to overstate. These are essays to be read and pondered, not just once, but again and again. Gratitude, therefore, represents a perfect thing, a collection of pages onto which an author, whose gifts combined a medical mind with a storyteller’s voice, committed his experience leaving life after having lived it to the fullest.